PARIS (Sputnik) - Students protesting education reform in France on Monday blocked the entrances of some 100 schools across the country, resulting in clashes with law enforcement, local media reported. In the Auvergne-Rhone-Alpes region, the students, some of whom are supporters of the "yellow vest" moment, threw various objects at police officers, who responded by firing teargas, according to the France Info media outlet. The protests are also taking place in the regions of Bourgogne-Franche-Comte, Centre-Val de Loire and Corsica, and Paris, among others. — Sotiri Dimpinoudis (@sotiridi) 3 декабря 2018 г. ​The French education reform in question was adopted on March 8 and modified the conditions under which students get accepted into universities. These changes went into effect on September 2018. Trade unions have criticized the reform, pointing to the element of "selection" it creates, something which contradicts the general right and equality in access to higher education for everyone. 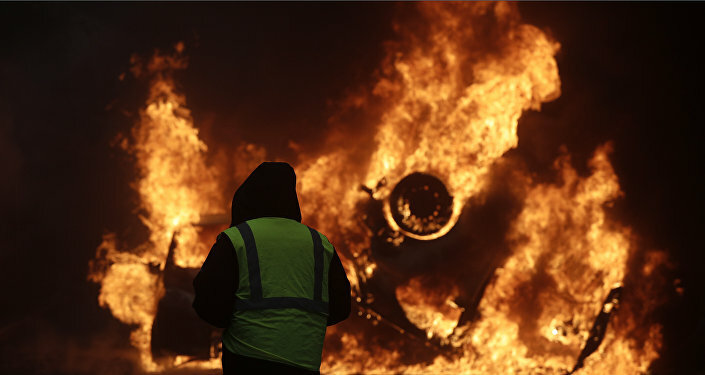 On Saturday, Paris witnessed mass violent riots organized by the so-called yellow vest activists, who are protesting the growing prices for fuel that were a result of a diesel tax passed last year. Over 400 people were detained and more than 100 people were injured, including police officers.